Wake Up, Ron Burgundy: The Lost Movie (also known as Anchorman: The Adventure Continues) is the 2004 counterpart film to the film Anchorman: The Legend of Ron Burgundy, which was also released in the same year. Directed by Adam McKay and written by McKay and Will Ferrell, it stars Ferrell, Christina Applegate, David Koechner, Steve Carell, and Paul Rudd. The film "follows the KVWN Channel 4 News Team as they investigate the extremist bank-robbing organization The Alarm Clock." 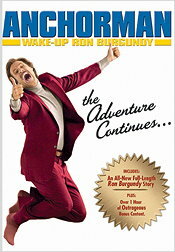 Bill Beyrer of CinemaBlend, reviewing the film as part of the DVD release for Anchorman: The Legend of Ron Burgundy, called it "quite possibly the very worst pseudo sequel ever"; according to Beyrer, "As much as it claims to be, this is not a continued adventure. Wake-Up Ron Burgundy is nothing more than a collection of deleted scenes and alternate takes ... sewn together with narration and a left out story element included to make it seem like a follow up. The worst part about this is that a majority of the alternate takes already appear on the deleted scenes or blooper reel of the first film, as well as a majority of the theatrical trailers." ^ Weiner, David (December 3, 2013). "Wake Up! Exclusive Anchorman 2 SuperTicket Details". Entertainment Tonight. Retrieved 2014-10-16. ^ Beyrer, Bill. "Anchorman: The Legend of Ron Burgundy (Unrated, Uncut, & Uncalled For!) & Wake Up Ron Burgundy". DVD Review. CinemaBlend. Retrieved 2014-10-16. This page was last edited on 20 January 2019, at 02:12 (UTC).